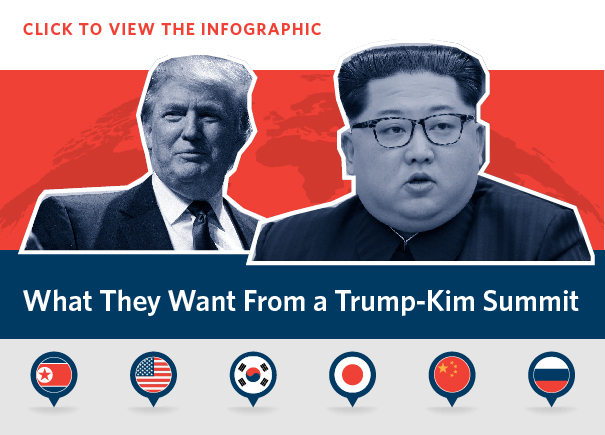 Summary: Whatever the outcome, the June 12 Trump-Kim summit will have major implications for the region’s security landscape. After months of political gaming, back-channel meetings, and rhetoric, it is difficult to predict the outcome of the much-anticipated summit between Donald Trump and Kim Jong-un. However, whatever happens in Singapore, it is likely to shape the future of U.S.–North Korean engagement, the U.S-led alliance, and the region’s security landscape. The Carnegie–Tsinghua Center asked Carnegie’s scholars from around the globe to share their perspectives on what each invested nation wants from the historic meeting. “Except for a total failure, any summit result would be a net gain for China. A substantive agreement would probably include North Korean measures to substantially cut, if not completely dismantle, its nuclear capabilities and U.S. measures to dial down joint military drills with South Korea and restrain its future military deployment on the peninsula. That would all be good news for China. Even a less substantive and more symbolic agreement would help reduce military tensions and decrease the chances of a war on China’s doorstep. If a basic deal on North Korea’s nuclear program can be reached, then China will likely want to contribute—probably through an initial, quadrilateral negotiation process—to addressing the other big issue of how to replace the armistice treaty with a peace treaty. “Japan would like to see the summit produce a credible process that can lead to complete, verifiable, and irreversible North Korean denuclearization (CVID) in a relatively short time frame, in exchange for a substantive diplomatic normalization process. But there is little hope in Tokyo that the Trump-Kim summit will lead to CVID. The Japanese government’s main goal, therefore, is to help avoid a bad outcome—one that would leave North Korea’s nuclear program largely in place but open the door to diplomatic and economic options that would strengthen the Kim regime, weaken the U.S.–South Korea alliance, and marginalize Japan’s influence on the peninsula. Abe wants Trump to keep North Korea isolated and weak until it makes a clear decision to denuclearize quickly and transparently.